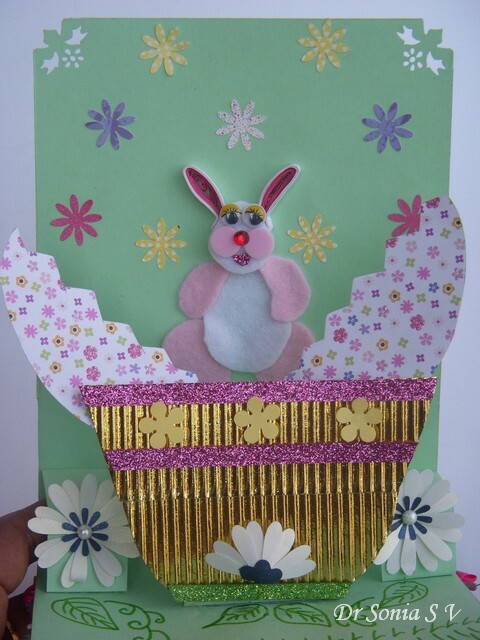 This interactive pop up card features an egg that cracks open on pulling the lower flap! The egg in the basket cracks apart by an ingenious yet easy to make pop up mechanism! Would you believe me if I told you my 5 year old helped me make this card! Well seeing all colors of the rainbow I think you will believe a little girl definitely had her hand in making this special pop up card! Here is our bunny peeping out through the cracks in the egg! 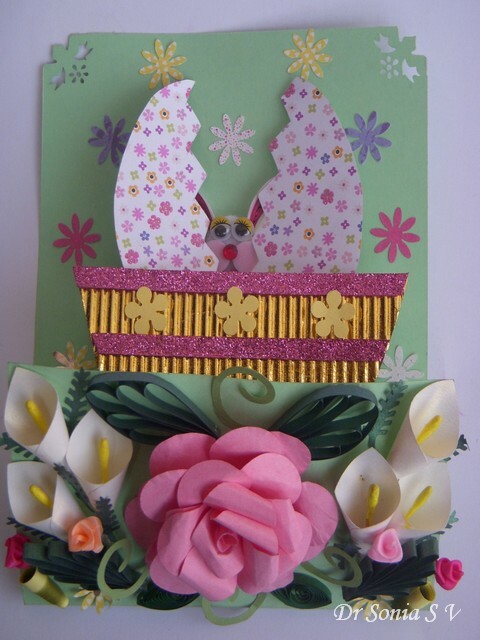 And on completely pulling down the lower flap--taa daa---little bunny in a pop up basket with spring flowers! 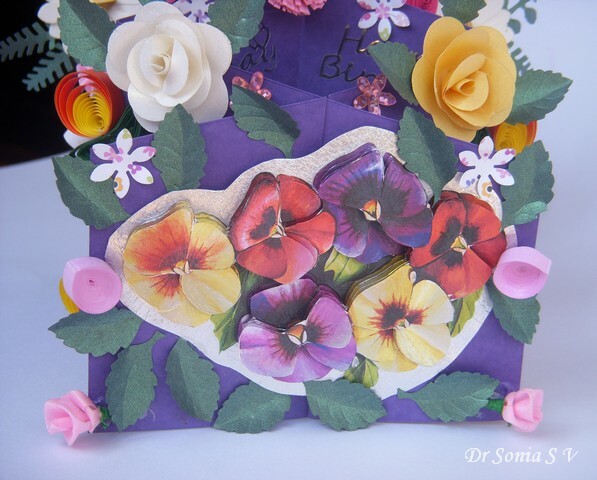 Closeup of the punchcraft flowers on the lower flap of the pop up card. 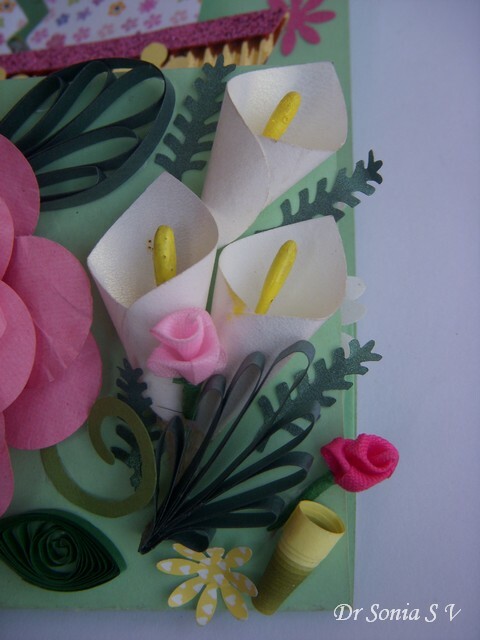 The Cala lilies are punchcraft flowers too and were quite easy to make..shall share its tutorial another time! Added some quilled leaves and buds to give company to the Punchcraft flowers. 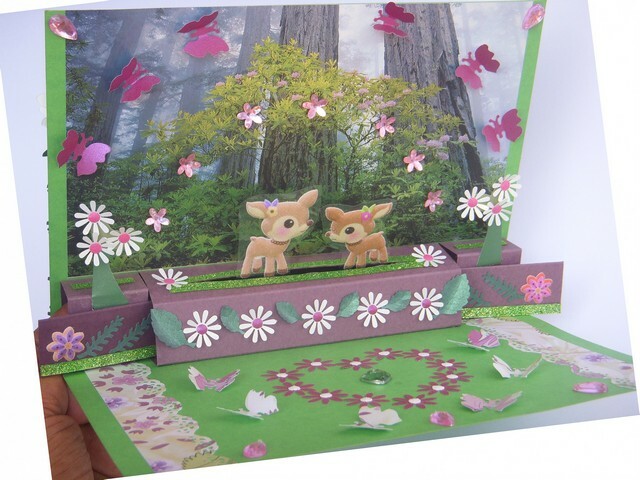 This pop up card was inspired by a card on Canon site which has some elaborate pop up cards--I simplified the interactive mechanism to make this pop up card tutorial. Draw and cut out an egg shape from sturdy card stock.Our egg measures 3 x 4.5 inches.Stick some pretty paper over it if you wish.Cut your egg into 2 halves in a zig zag as shown . 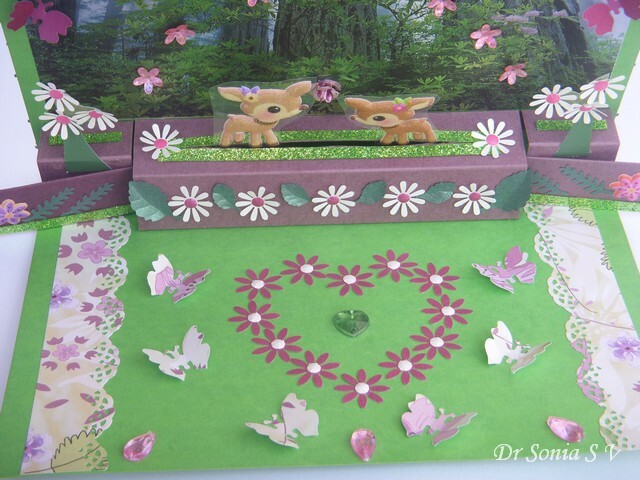 [Click on the photo to better see the pop up card tutorial ]. 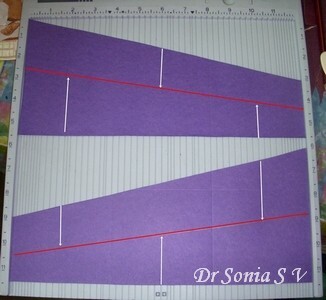 Take 2 strips of card approx 1inch x 3 inches [ I didnt measure and you need not either! 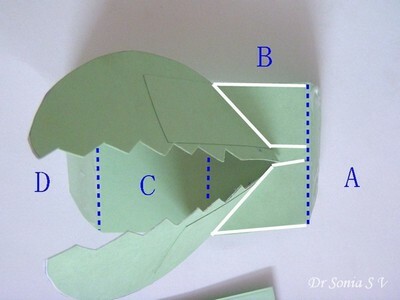 ].Fold the card strips as shown in the photo and apply glue to the part shown and stick the lower part of your egg.The last photo in the collage is how the egg- card strips should look to make your egg pop up card! I scored a 2.5 x 5 inch card at 1, 2.5 and 4 inches. 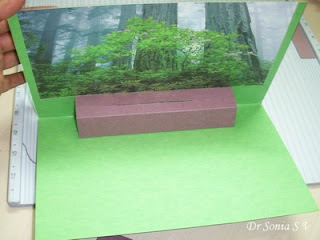 Mountain fold all score lines.Parts A and D are tabs of your Pop up card pedestal. 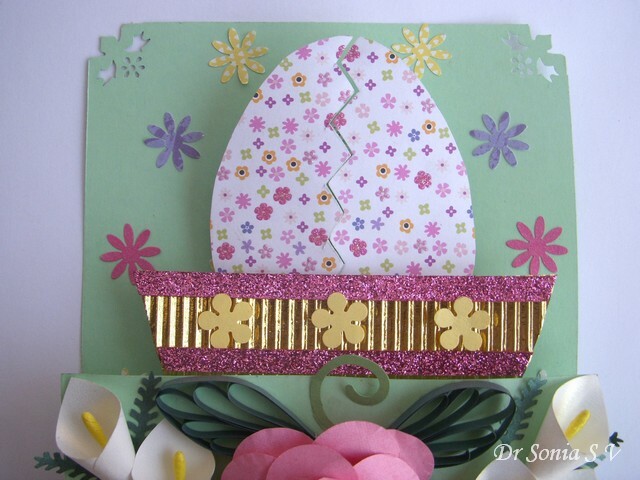 Apply glue to the front of the egg-card strip [green part only] as shown and stick it on surface B of the pedestal of your Pop up card .Stick the 2 egg halves such that the edges are snugly fitting each other. Surface B measures 1.5inches and excess part of the egg-card strip stuck on it can be cut off . 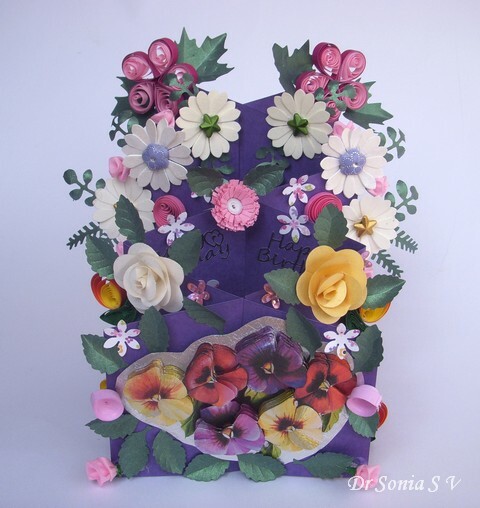 [Click on the photo to better see the pop up card tutorial ]. 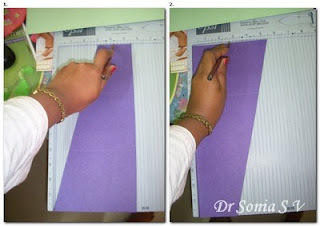 Apply glue on the surfaces A and D, fold them under and stick to your card base aligning the score line between B and C with the fold line of your base card.My base card is 9 inches long with the fold line at 3 inches.Surface D should be stuck to the shorter flap and surface A to the longer flap as shown. Cut out a basket to cover the whole of surface C and jut above it to cover the lower part of the egg by 0.5 inches or so so that your egg cracks open correctly! 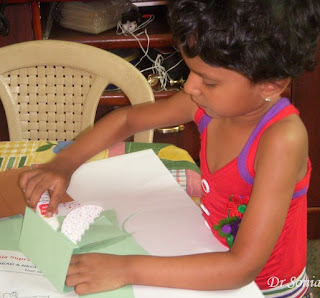 Here is my little one applying glue on surface C to stick on the basket for the easter egg! 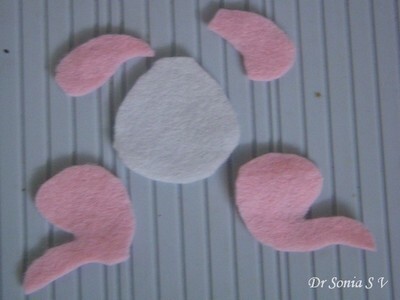 We made a bunny by hand cutting some felt. 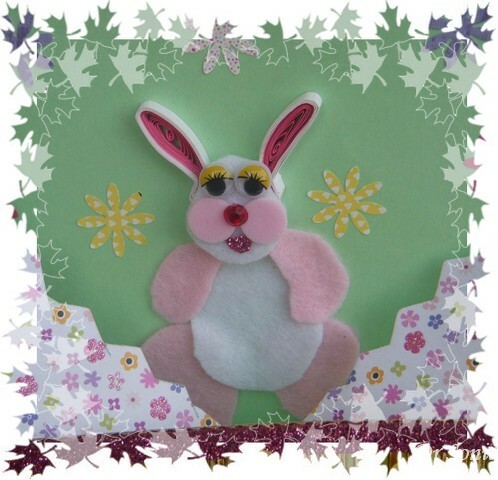 Gave our bunny some quilled ears and a rhinestone nose! As always I find myself saying dont be daunted by the number of photos in this tutorial-- it is a fun card to make and play with. Its my mom's birthday today and last night I baked her favorite cake which is carrot cake.At home none of us like to eat cake icing yet I didnt want my mom's cake to look plain! I won a Pie Lane challenge recently and dear Tejal whom I consider a "crafters encylcopedia "sent me some stencils and she also shared a stencil embossing tutorial with a cuttlebug.I dont own a diecut/embossing machine but decided to emboss with my stencils anyway-- in a crazy way!! I decided to try some edible stencil embossing minus the cuttle bug or the heat gun! ! 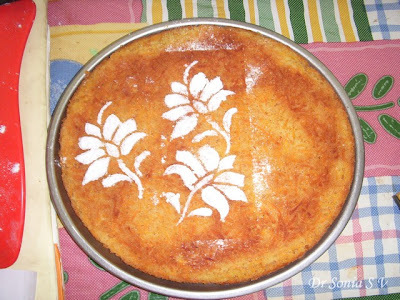 I am no expert at cake decoration and this was the first time I tried a stencil on the cake so in these pictures taking you along on my cake decoration adventure . Stencil - metal or plastic or homemade! 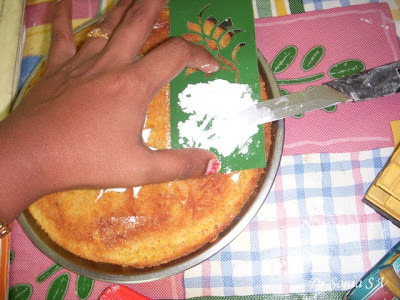 A knife or spoon to spread the icing sugar on your stencil. 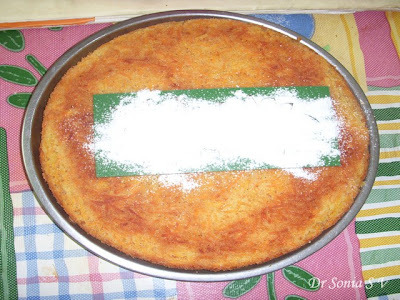 This picture below shows a mistake I made -- sharing that too so that you can avoid it when you try it! 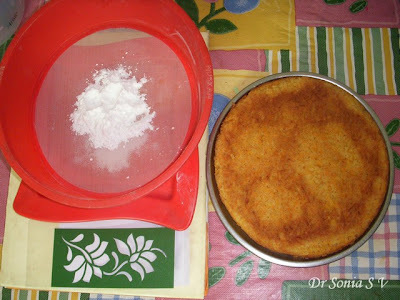 I sprinkled icing sugar by hand onto the stencil without giving thought to how much was falling on the cake.I thought I would be able to brush off the "extra" sugar later! The icing sugar stuck on the cake so firmly I couldnt remove it! By the the 2nd attempt I was more smart and so only sprinkled a tiny bit of sugar using a knife. That looks much better doesnt it! 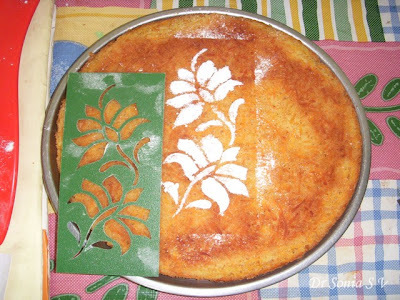 By the last stencil design I was more of an expert and decided that gently patting the thin layer of sugar gave it a nice uniform surface on the stencil design! Use both hands to lift off the stencil from the cake and your lovely stencil design is embossed on the cake! 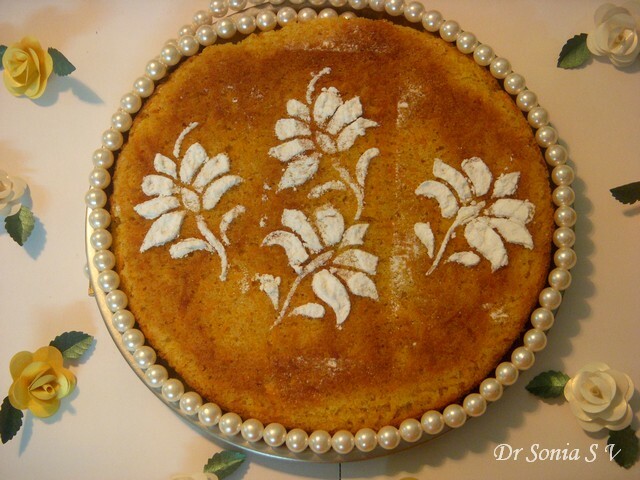 Using this stencil idea it was so easy to "ice" this cake- took just 10mins! Do forgive the dim lit photos---this was done at midnight! 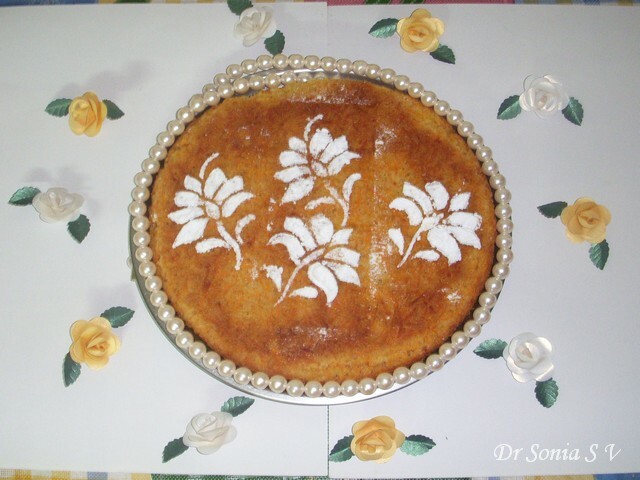 And do try this type of edible craft even though my maiden attempt is a bit clumsy! I am sure you can do a better and more imaginative job at stencil cake decorating! Slider Cards are such fun interactive cards. 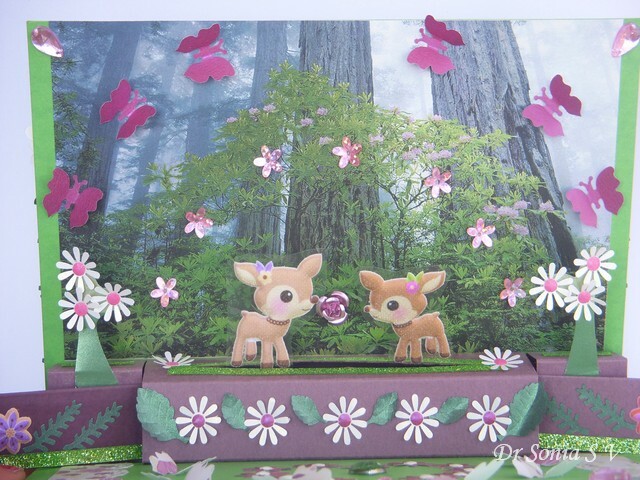 This one is a pop up card with a slider mechanism that makes the deer slide towards and away from each other via slider strips. I saw this slider mechanism in a children 's pop up book and when I tried making it , I found it was tricky and simple at the same time !!! Sharing a frugal crafting tip : Recycle! 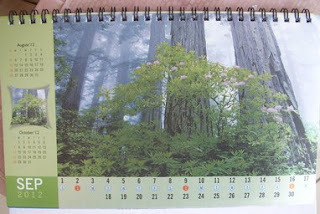 I used the gorgeous glittery images from this calendar on my slider card ! I used a shimmery scenic image from the calendar for the front of my slider card. I wont share my usual step by step tutorial photos here as I was so involved in designing this card I forgot to take photos!! 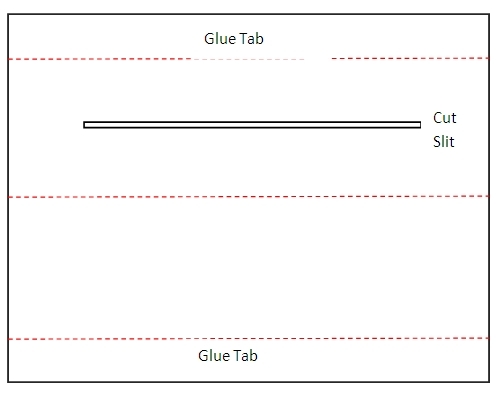 So this tutorial is just a guideline on how to make your own slider card! This is the pop up card template with a slit cut out for the sliding parts.I am not giving measurements as you can make it however you want to! Mountain fold on the red dotted lines and stick the glue tabs to the base card to get a pedestal pop up card .If you are unfamiliar with how to glue a pop up card strip here is the link : pop up card tutorial. 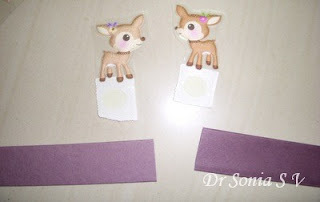 I made sturdy slider strips for my deer by scoring a 2.5 inch wide card strip at 1 inch and 2 inch .Fold the strip at the scored lines, and stick by applying glue on the the 0.5 inch part and folding over. This gives you a thick and sturdy slider for your slider card. You can see my crafting companion in the pic above!! Yeah I mean not only the scor pal but my Cocker spaniel Goldy waiting patiently for me to go to bed! I made 2 slider strips for my deer. The deer are stickers which I left stuck on its plastic backing.Applied glue dots on the plastic and stuck it on the slider strips. 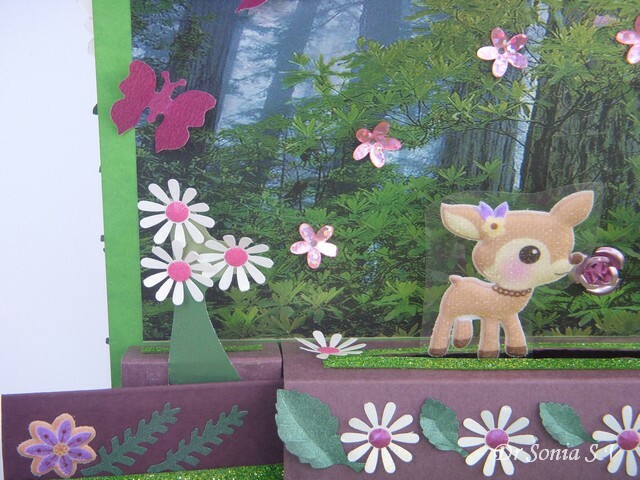 Now here are the tricky bits :I had to experiment to get the height of my sliders to fit well within the pop up strip and I also had to experiment to get the height of the plastic strip on the deer right so that the deer would project just right on the pop up slider card ! I found my sliding mechanism wobbly and to correct that I added 2 backing pop up supports on either side where the deer sliders exited the central pop up strip!In retrospect I also think it would be easier to slide in the sliding deer in the cut slit before attaching it to the base of the slider card! Sometimes a "card " decides how it is going to be, dont you think ?! 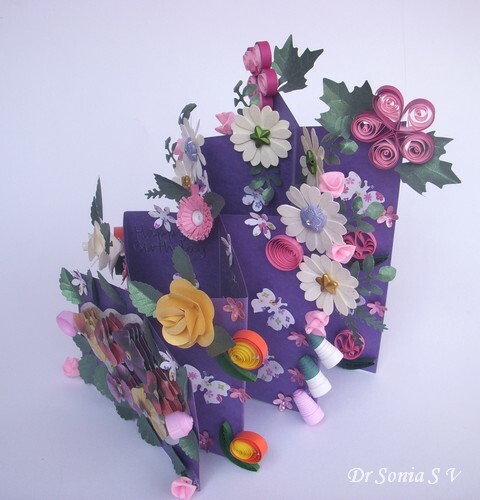 What I had intended as a romantic elegant card when I made the front of the card ended up a childish though somewhat cute card once I had finished all the popping and sliding mechanisms! So do boost my morale by telling me how you like this interactive card! 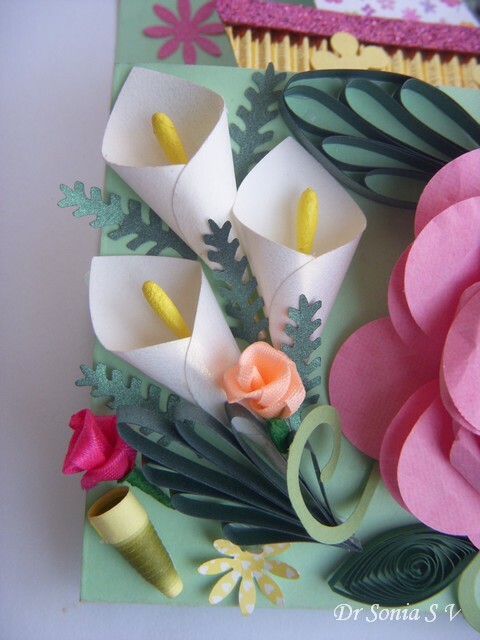 Cascading cards look stunning and complicated but are not that difficult to make.These special accordion folded cards have 2 interlocking panels which can spring apart and also collapse to fold flat! 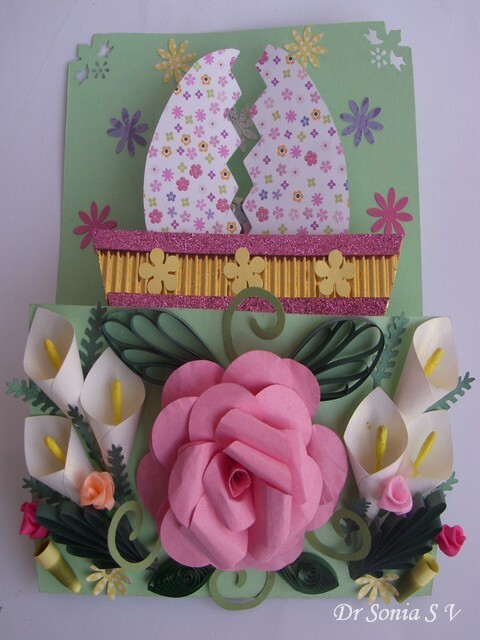 This is a special card for my mum who loves flowers so added punchcraft and quilled flowers to the layers of my cascading card. 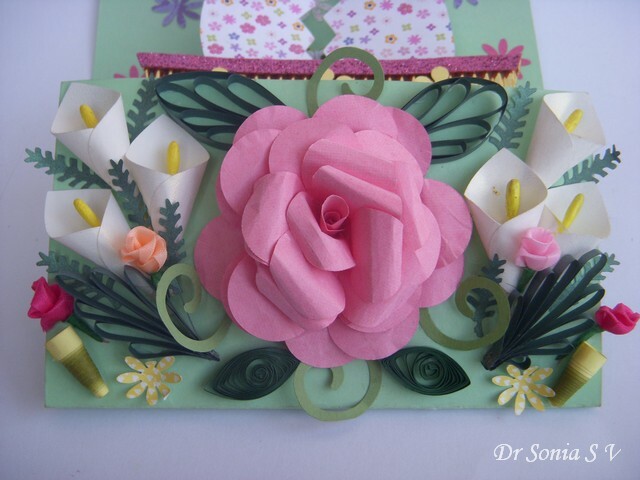 The white daisies were a gift from my blogger pal Jovita.The roses are punchcraft roses made using a 6 petal punch.The pink buds are quilled coils and the tiny roses are ribbon roses. 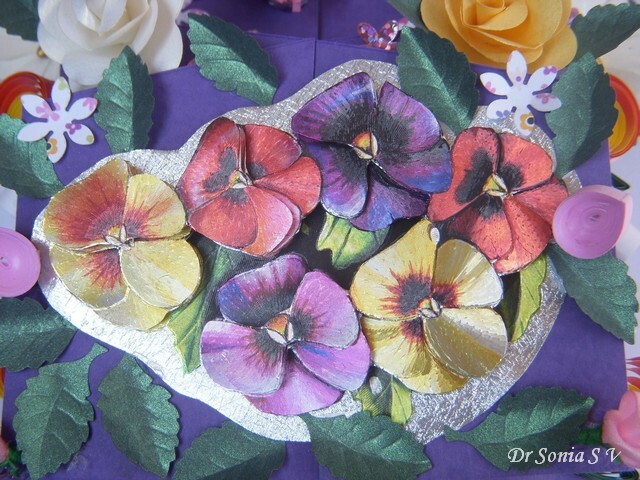 I made a 3 D decoupage posy of pansies for the front of my cascading card. 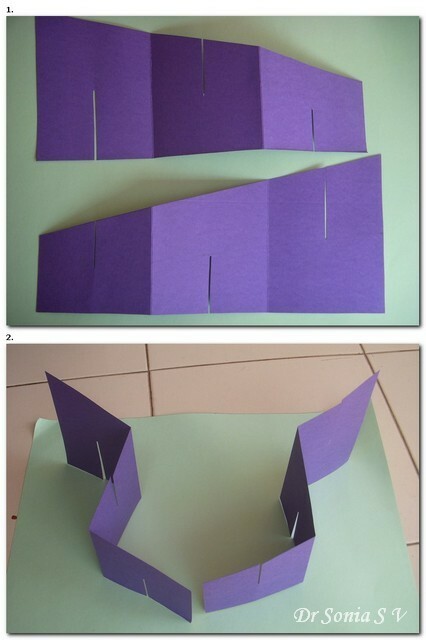 How to make a Cascading Card. 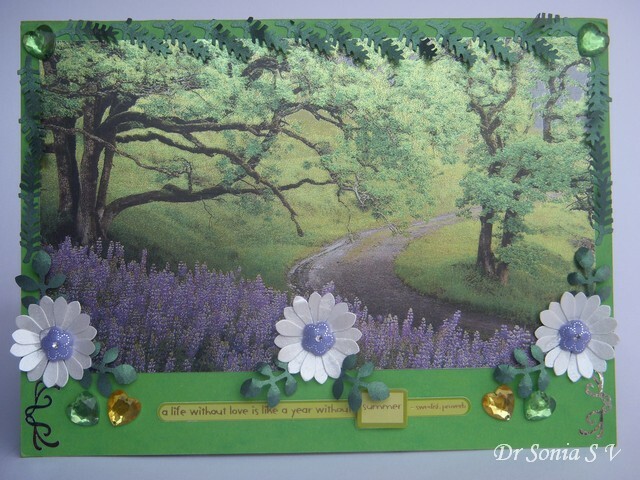 I made this cascading card using a Card template which was so generously shared by Penny .Penny's original template is a gem but looks scary and complicated until you break it down to little steps! So just to make things easier, sharing some step by step instructions on how I made Susie Prendergast's Cascading Card. Card stock : 2 pieces measuring 5.5 x 12 inches - use fairly thick sturdy card if you want to add lots of embellishments like I did. 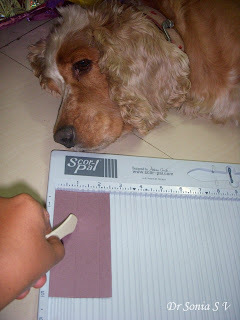 Scoring tool- if you dont have one use a blunt knife or dry pen. Mark 3 inches down one side of the card stock as shown. 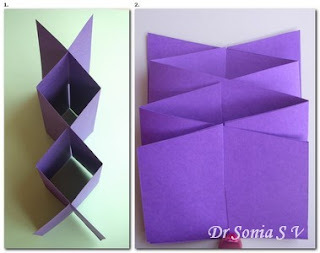 Cut off the white triangle you get as shown in the cascading card template.Do this for the other piece of 5.5 x 12 inch card too to get the panels of your cascading card. The Cascading card is just 2 accordion folded cards interlocked together by slots.To help you know where to make your slots you can mark both your panels as shown. 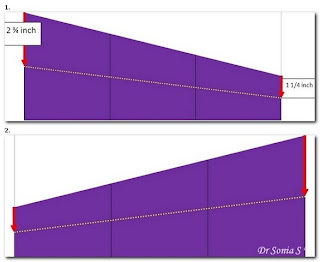 If you are using a scale mark the midpoint of 2 sides of your panel as shown. Measure 2 3/4 inch on the taller side and 1 1/4 inch on the shorter side.Join with a pencil line. I used a score pal as shown below to help quickly find the midpoint. I marked the short side and turned it 180 degree clockwise to mark the longer side's midpoint. 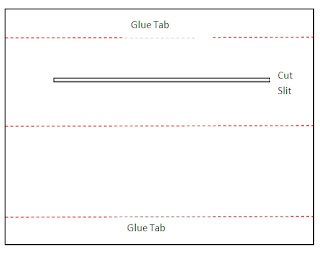 Your Cascading card panels are mirror images and shown below is how the panels will look marked. Score your panels at 4 inch intervals[ black lines]. If using a score pal score at 4 and 8 inch mark. Make the slots:If you use a score pal it is super easy to make your slots.Drop down score lines to meet the pencil line marked earlier. The slots will be at 2 , 6 and 10 inch marks as shown. Cut out 1-2mm wide slots.Accordion fold your panels as shown. 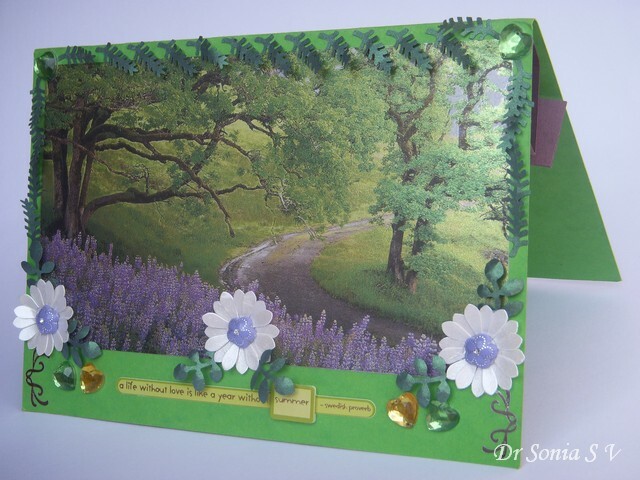 The folds are Valley- Mountain in the 1st panel and Mountain- Valley for the 2nd panel of your cascading card. Interlock the slots of your cascading card starting from the taller end.The slots fit so nicely together that no glue is required and your card will expand and collapse at will! 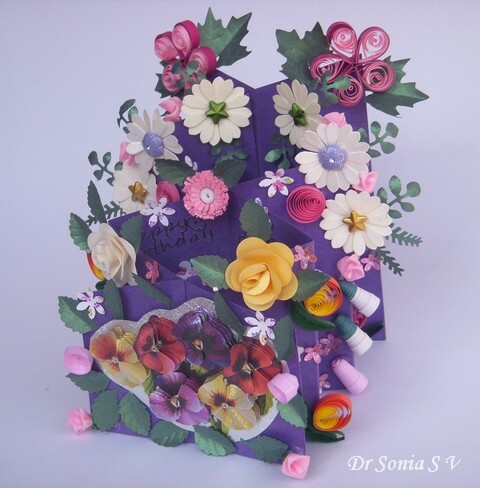 To allow easy movement of the accordion mechanism, I attached the 3 D paper tole flowers only to one panel on the front of my cascading card. 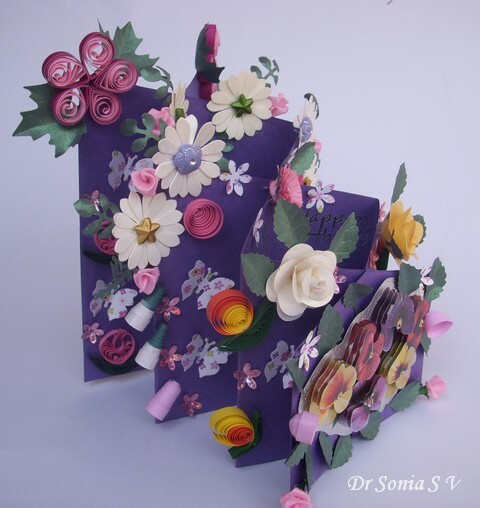 Do try making this fun interactive card .Do tell me how you like this special card made for my mom!